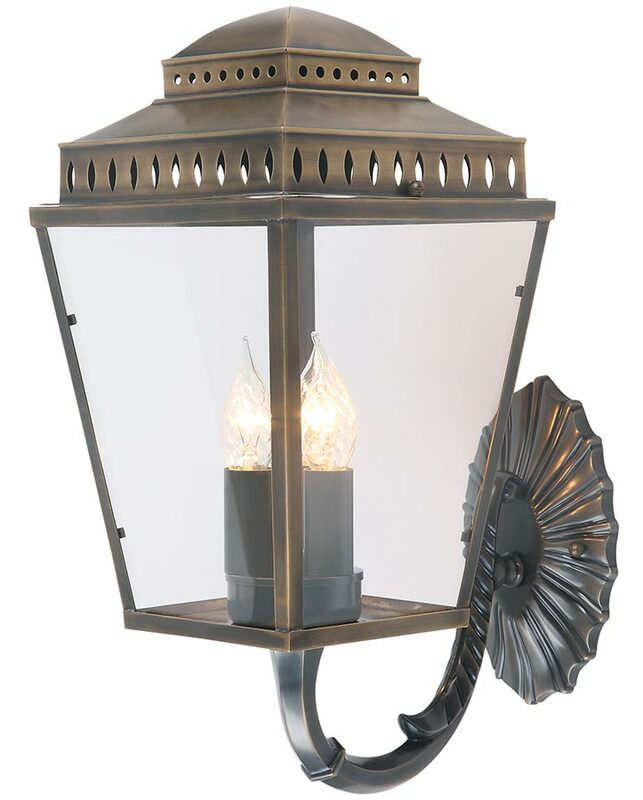 Elstead Mansion House solid aged brass 3 light outdoor wall lantern is rated IP44 and handmade using original designs dating to the pre-Georgian era, with soldered joins for a totally authentic handmade look. The Mansion House garden wall light has detailed oval wall mount featuring a ribbed starburst design, with cast arm and upward facing tapered lantern. Boasting ventilated roof cut-outs and back plate for a warm inviting reflective light. A typical Georgian style garden wall lantern, with candle style lights. The aged brass finish in the Olde England collection is a welcome addition to the classic finishes and you can’t but help to imagine this finish on an older style property, providing a classical, Wow factor statement! This classic light is supplied by Elstead Lighting, a British company that specialise in the manufacture and distribution of quality decorative lighting such as the Mansion House solid aged brass 3 light outdoor wall lantern and rated IP44 you see here.